Let the gays have this one! On a recent episode of the Cartoon Network animated series Adventure Time, moody vampire goddess Marceline sings a song titled "Slow Dance" about the longing to get close with an unnamed love interest. Fans speculated the song was about Princess Bubblegum (we know the two have dated in the past) and the internet quickly inserted it into theories and fanfics shipping the couple together. "I wrote Slow Dance about this girl who didn’t like me cause she had a boyfriend lol," Baggins explained. 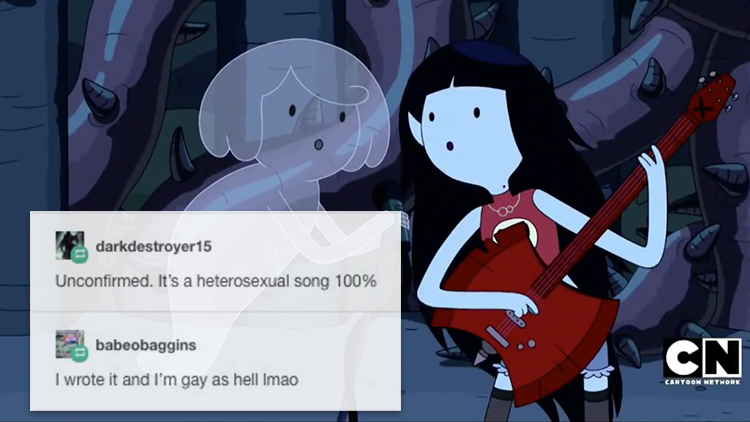 But many heterosexual Adventure Time fans couldn't handle the song not being about them. Baggins, who's also very involved in the Tumblr community, went back and forth with a couple of naysayers after someone posted screenshots of the tweets. "It's heterosexual 100%," wrote one user. "I wrote it and it's gay as hell lmao," Baggins replied. "How about maybe," wrote another user. "The song is for anyone, because we've all been there, wanting someone who's with or wanting someone else." "No..." Baggins remained steadfast. "I wrote it... It's for the Gays." Straight people already have 93% of TV shows. Let the gays have this one!